← NS45 Vouchers And FREE SAFRA Membership Card Arrived! Featured items on sale includes branded bags such as Longchamp handbags, Casio Edifice Watches, OPI Products, Crabtree & Evelyn HandCare products, Victoria’s Secret BodyCare products, Olay Professional Pro-X Advanced Cleansing System and many more popular items – at 50% Discounts (or more) off their usual price ! To celebrate Qoo10’s birthday with all their fans and friends, Qoo10 Singapore is also giving out S$20 worth of Birthday Exclusive Discount Coupons here! *Yes, I tried to claim the coupon pack again, but was greeted with this Ha Ha! 10 Reasons Why You Would Want To Shop With Qoo10 ? Qoo10 is your Incredible Shopping Paradise for Newest Products, Latest Trends, and Bestselling items from Singapore, Japan, Korea, US and All over the world at highly discounted price! Qoo10 is owned by Giosis Pte Ltd, a joint venture between eBay, the world’s largest online marketplace (with a 49% share) and Gmarket Inc. founder, Mr Ku Young Bae )with 51% share). With such big names backing the company, we know that this is serious business! Qoo10 provides Buyers’ Protection when you shop. If you make your purchase payment through Qoo10’s suggested payment options, the payment amount is held by Qoo10, and it will only be released to the seller once you’ve confirmed the Delivery of the item. There are always ongoing promotions and sales, ie. Daily Time Sale, Group Buy Deals, Hot Deals, Weekly Specials, Auctions , Special Events Promotions (such as the recent 3-Day Happy Easter Sale, this upcoming Qoo10 Birthday Sale), and more! 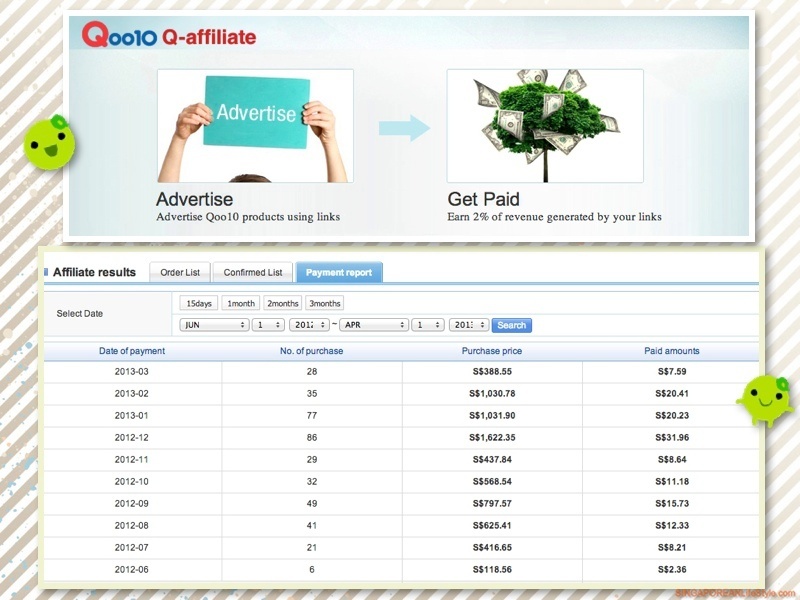 If you enjoy sharing great deals and bargains with your friends (on facebook, twitter, your blog and even via email), you can also make some extra pocket money while doing so.With Qoo10’s Q-Affiliate Programme, you earn 2% of the revenue generated by your links! You can keep the amount earnt in your Qoo10 account for your future purchase, or you can withdraw them out as cash too! Earn Q-Stamps when you write a review, purchase an item or win it from the RouletteQ at the Lucky Lounge and use them to purchase items, participate in events, exchange for coupons or even use them for donation to Charity! Other than Shopping online using your desktop computer, you can also do your shopping while on the move with Qoo10’s Mobile App available for both iOS and Android devices. There are also regular events to give out attractive prizes to their users, such as iPhone 5, the new iPad, MacBook Air, branded bags and more! The mobile app is available in three languages and is localised according to each country Qoo10 is based in, ie. Singapore, Japan, China, Hong Kong, Indonesia and Malaysia. In appreciation towards their mobile app users, Qoo10 organised a Global Thank You Event last year, where users stand to win up to S$1 million worth of prizes!! Now, for the prize we’ve been waiting for..
From now till the 22nd April 2013, you have the chance to be the lucky winner of the iPhone 5 by guessing Qoo10’s age correctly here! I am also participating in the contest and I hope I can be the lucky winner of the iPhone 5 too! Happy Shopping, and HUAT AH !! !